Here’s another String for your creative enjoyment. This is another one is shared by tangler Hope Martin who also shared String 008. 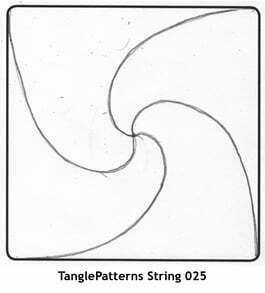 I’ve noticed some folks are making the string the main focus of their Zentangle® when actually the string is meant to disappear like magic into your tangles. Normally in a finished Zentangle the string is not obvious. Occasionally you might want to accent some part of it with a border-type pattern but generally it won’t be apparent in your finished art. If you play the slideshow on the zentangle.com home page, you’ll observe what I mean. 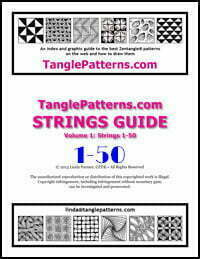 Strings form the invisible backbone of a Zentangle and that’s part of its magic. 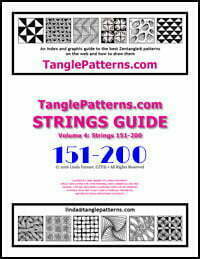 Bear in mind that Zentangle® strings are guidelines. You can use it exactly as it is or adapt it to suit as your Zentangle grows. Start with the string as it’s shown then, as you go, combine sections if your tangles want to, or divide a section into smaller ones. Go with the flow and enjoy. love this one – it should be fun! That is quite a coincidence! Can’t wait to try it! I would love to share my tangle with you – how do I do that? Hi Sue, I’m not clear about your question – but if you’re asking how to submit a pattern please see the SUBMIT YOUR PATTERN tab at the top of the page. If you’re asking about sharing a Zentangle you’ve completed using the string, see the “TanglePatterns Strings group on flickr” link above. Thanks! Great to be reminded all Strings can disappear or be added to! Mine seem to be all done at the whim of my pencil-in-hand! What a thrill to stumble on this! I feel famous! Love having these strings. Thanks for doing this! !